Wendell Phillips Elementary supporters wore blue and Attucks Elementary supporters wore purple at Wednesday night's KCPS board meeting. The board approved a new master plan on a 7-2 vote. 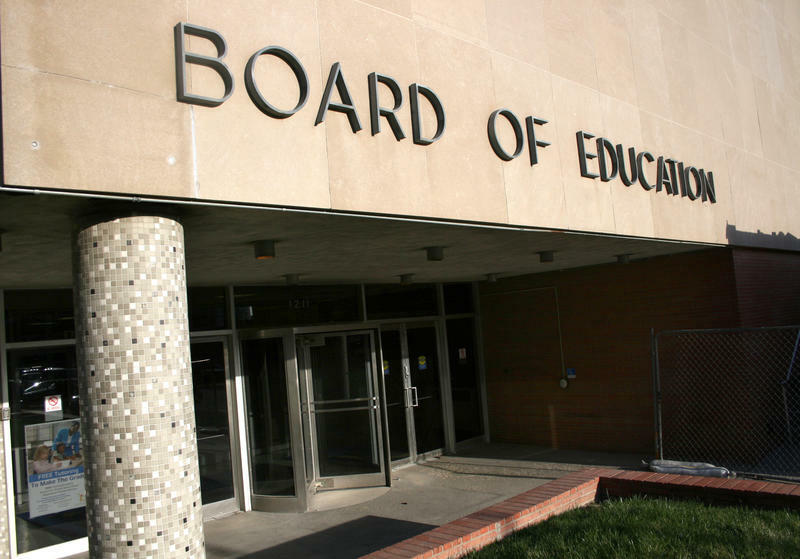 After three hours of public comment and debate, after numerous parents and teachers fought it, a divided Kansas City Public Schools (KCPS) Board of Education voted to make sweeping changes for next school year. The KCPS plan was two-and-a-half years in the making and failed to get board approval when initially offered in November. The master plan will move many school boundaries effecting up to 15 percent of the district's students. It also closes Southwest Early College Campus and move its students to East High School where they would join students from African-Centered College Preparatory Academy (AC Prep). The district will also close Satchel Paige Elementary near 75th Street and 71 Highway. But in the end, the most controversy was generated over what to do with Wendell Phillips Elementary near 24th and Vine and Crispus Attucks Elementary just a few blocks south on Prospect Avenue. The plan calls for moving most students and staff from Phillips into the newer Attucks building. While some Attucks students would remain many would be moved to other schools with the boundary change. Few in the packed board auditorium were pleased. “Simply put, Attucks deserves to stay open. It is the heart of a community with a long-standing tradition of educating students and serving the needs of special populations,” Attucks parent Mindy Wilson told the board. "It should be allowed to continue its journey." Phillips parents argued at the last board meeting against moving into Attucks. 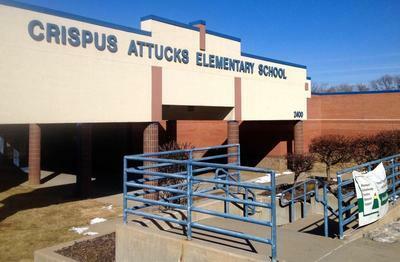 The district says Attucks is newer and Phillips needs at least $3 million in modernization. But the Phillips parents also said they've worked hard over the past ten years to create a community and get the school accredited. The district says the accreditation will follow the students to Attucks. Many students and teachers will move from Phillips Elementary to Attucks Elementary next school year. But underlying all of this is the decision by KCPS to hand over the Phillips building to the the United Neighborhood Initiative that plans to open the Kansas City Neighborhood Academy charter school next year. Interim Superintendent Al Tunis says the charter could use private money to make the needed improvements. At one point the board considered whether to move forward with the master plan but keep open Phillips, Attucks and Southwest. That failed. At another point it was suggested just putting the whole thing off until the 2017 school year. That also failed. The board finally approved the plan on a 7-2 vote. Many parents charged the master plan is just a way to save money. The district says it will save about $8 million a year. But that money, the district says, will be reinvested. “There was never an interest about saving money. It was redirecting our resources to better serve our students,” Tunis told the meeting. The master plan would also enhance transportation. Students could bus to school if they lived a half-mile away. Their bus stop would be no more than two blocks from home. Currently, they must live 1.5 miles away to ride the bus. The district says 1,400 walkers would now be able to ride the bus. The new plan would also create year-round schools for the four lowest performing elementary schools in the district and lower class size over time for all elementary schools in KCPS. The original plan called for year-round schools and lowering class size at those under performing buildings. But after the district held more meeting with parents, students and patrons, the revised plan calls for lower elementary class sizes across the board. The revised plan also creates what the district is calling "college and career pathways" at its neighborhood high schools. The previous master plan called for themed high schools but after additional meetings the district landed on pathways such as computer science, biomedical science and construction technology. Natalie Lewis is eligible to be a candidate for the Kansas City Public School Board. There is no doubt, she says, after a critical deadline was deleted sometime Friday from the district's election notice online. "Because of that information, I almost walked away twice. But I knew in the gut of guts and in talking to people that that information was not accurate," she says. Write-In Candidates For KCPS Board Face This Question: Are You Crazy? Natalie Lewis really wants to be on the Kansas City Public School board. How much? Last week she moved into the district to an apartment just off the Plaza for the express purpose of running for the open seat in Sub-District 1, which covers much of downtown. "Yes, it was drastic. But that fact that we had no one on the ballot required a drastic reaction," she says. A modified master plan for Kansas City Public Schools (KCPS) consolidates two east side schools and turns over one of the buildings to the district's charter school partner, a plan that packed parents from the targeted school into the board meeting Wednesday night. The new plan still closes Southwest Early College Campus and moves its students to East High School. It also still closes Satchel Paige Elementary on east 75th Street. Kansas City Public Schools officials announced the district's new superintendent Wednesday. Mark Bedell has been an assistant superintendent in the Baltimore County District for the past four years. He began his career in Houston. He beat out Ron Taylor, the superintendent in the Willingboro, New Jersey, district.